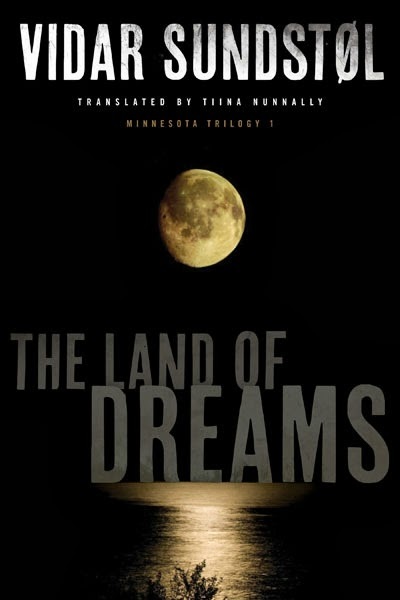 UMP | University of Minnesota Press Blog: "The landscape with its special magic and the people with their stories": How Minnesota's North Shore inspired Vidar Sundstøl's chilling Minnesota Trilogy. "The landscape with its special magic and the people with their stories": How Minnesota's North Shore inspired Vidar Sundstøl's chilling Minnesota Trilogy. Vidar Sundstøl in Two Harbors, Minnesota. Photographs by Shea Sundstøl. The last seven years of my professional life in Norway have been focused on writing or speaking about the North Shore of Lake Superior. The people, the forest, the lake, the history. However, I have not traveled back to Minnesota once during the course of these seven years. The real place has become increasingly distant from me, while the fictional North Shore that I have written about has been clearer and more detailed for every year that has passed. I remember very clearly the first time I laid eyes on Lake Superior. My wife and I had lived in Kentucky when she was offered a job with the US Forest Service in the Superior National Forest. We drove up to find a place to live. After a couple of days with a fairly uniform prarie landscape outside the car windows, there occurred something that I will remember as long as I live. There is a place along I-35—I can't remember exactly what it is called anymore—where Lake Superior appears without warning, in all of its majesty. This wide expanse of grey water hit my eye like something out of another world. The whole landscape was suddenly changed completely, and somewhere inside me I knew that everything else was about to change as well. It wasn't just a new chapter in life that was beginning. It was a whole new book. It was raining as we drove down the hills into Duluth. I still remember seeing the city for the first time: the wooden Victorian houses along steep streets oriented toward the lake. We listened to A Prairie Home Companion on the car radio while we drove down those hills toward town. It was Memorial Day, 2004, and Garrison Keillor sang an incredibly sad song about an old man who observed Memorial Day every year. And every year there were fewer of his companions left. In the end, there was only him. In this rather grey and heavy atmosphere we drove into the tunnel with stylized Viking ships along the top. I remember thinking that we had definitely left the South behind us. I hated the North Shore. There were no people there, only trees and that endless, grey lake. But I had to live there, because that is where my wife worked. When we moved two years later, I remember thinking: This can't be true. We can't leave the North Shore. Not for real. We can't do this. But we had already planned everything, and my elderly parents were waiting for us back in Norway. Minnesota where Cross River meets Lake Superior. What happened in the meantime? How did "I hate this place" become "I can't leave here"? It was a mixture of two things: The landscape with its special magic and the people with their stories. Stories about their ancestors who came from Norway or Sweden a couple of generations earlier. At Tofte Cemetery I saw headstones with the names of people who had been born in Norway and who had left everything they knew to find a new future. Not the old future. That was left behind in Norway. On Halsnøy, perhaps. All of this, and many other things, made it difficult to leave the North Shore in the end. In just two years I became connected to the area with ties that have of course become weaker with time, but which will never be completely gone. And the strongest of these ties is probably the books I planned while living there and which I wrote upon returning to Norway. The Minnesota Trilogy. It was a breakthrough for me, as a writer, both in Norway and internationally. For many years now have people been able to read about Lance and Andy Hansen, sheriff Bill Eggum, and the murder at Baraga's Cross in French, German, Dutch, and many other languages. Now the story is finally coming home. And maybe that is what I am doing when I will soon travel to the North Shore. Maybe there is a little part of me that feels like I am coming home again.